Hugely popular Mexican fighter Saul “Canelo” Alvarez scored a smashing 9th round TKO over Britain’s Liam Smith to win the WBO junior middleweight crown before a record-breaking crowd of 51,240 mostly adoring fans at the AT&T Stadium in Arlington, Texas, home of Jerry Jones Dallas Cowboys Sunday morning, Manila Time. The crowd was bigger than the 50,944 fans who watched eight division world champion Manny Pacquiao score a lopsided twelve round unanimous decision over Joshua Clottey in a defense of his WBO world welterweight title in 2010 and the 41,734 who returned to the venue to see Pacquiao dismantle Antonio Margarito in a WBC super welterweight title showdown in 2012. Regarded as one of the best pound for pound fighters in the world, the Mexican challenger dropped Smith in both the 7th and 8th rounds before nailing the British champion with a horrendous left to the body that sent Smith to the canvas in a crumpled heap in the 9th round. A jubilant Alvarez jumped on the ropes in the corner and raised his hands in triumph as his fans showed their adulation. 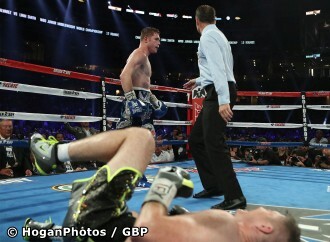 Photo: Canelo Alvarez goes to a neutral corner after dropping Smith with a crunching body shot. Photo by Tom Hogan / HoganPhotos / Golden Boy Promotions.